A porch may evoke thoughts of wiling away hours with family or friends on warm summer evenings. Or it might put you in a solitary mood that includes a porch swing, a cup of coffee, and a book. Whatever it says to you, a porch provides an open-air window on the social life that passes your house. 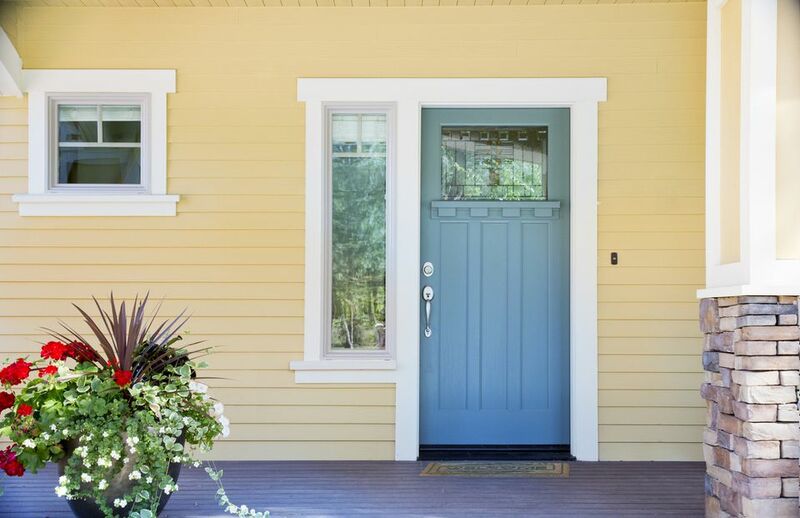 With one foot on the inside and another on the outside, a porch acts as a transition zone: supplemental living space that can be decorated and furnished to meet your tastes. Building a porch also adds solid equity gain and curb appeal to your home. These plans show you how to build a basic open ground-level porch for the front or rear of your house. Optional guardrails provide a decorative finishing touch. At 12 feet wide, 6 feet deep, and less than a foot high, this porch is a moderately easy build, as long as you allow for plenty of time to complete the project and have the occasional help from a partner. You may need to obtain a building permit before building your porch. As an exterior floored structure attached to the house, a porch is often classified as a deck in many municipalities' building codes. Check with your local permitting department and be prepared to convey details about the intended project. The permitting department can give you information about the required depth of foundation footers in your area. Because you will be digging, also call your local utility locator service to avoid hitting critical electrical, gas, and water lines. The easiest way to determine the best porch style is to match your house's style. This porch design is simple and allows for subsequent embellishments that bring the porch closer to the house's style. A Queen Anne-style home, for example, may be complemented with a porch that follows basic Queen Anne style cues such as ornamental details and bold colors. Based on the footer depth information obtained from the permitting department, dig three holes at that prescribed depth, all of the holes 6 feet away from the house. The two end holes should be 12 feet apart, with the third hole directly in the middle. Disperse the two bags of gravel between the holes to create a gravel base that is about 6 inches deep. Place the form tubes in the holes. Mix and then pour the concrete, embedding the metal column bases at the top of each form tube. On the six-by-six, mark off three sections that correspond to the desired porch height. These sections will attach to the column bases for the porch joists to rest on. Subtract 9 1/4 inches from each section to account for the actual height of the two-by-tens that will form the porch joist base plus another 1 1/2 inch to account for the porch flooring. Finally, be sure to take into consideration the drop from the door threshold to the porch surface: between 1 1/2 inches to 3 inches. Attach the three post sections to the footer bases. The ledger board runs the width of the porch and attaches the porch to the house. If necessary, remove siding in this section. Strike a level line with the laser level and attach the ledger board at the desired height with the 1/2-inch lag screws, using the ratchet wrench. Attach two of the double joist hangers at each end of the ledger board. Double up and attach two 12 foot-long two-by-tens to the metal footer bases to form the rim joist. Attach the remaining two double joist hangers at each end of the rim joist. Cut two two-by-tens in half, then run the resulting four 6-foot boards (doubled up) from the double joist hangers on the ledger board to the adjacent double hangers on the rim joist. Attach the single joist hangers every 16 inches on-center both to the ledger board and to the parallel two-by-ten. Cut six of the two-by-tens at 6 feet each, insert them in the single joist hangers, and secure them with fasteners. Because this porch is 12 feet wide, you can use 12-foot long appearance grade pressure-treated boards for the flooring, running them the entire width without interruption. Face-nail the boards onto the joists. For a smoother look without visible fasteners, consider purchasing a pocket jig tool such as the Kreg Pocket Hole System or even a tool designed specifically for deck boards, such as the Camo ProTec system. If you choose exotic hardwood such as ipe for the flooring, these boards attach with proprietary clips from underneath. Leave a 1/8-inch space between the boards. Though the porch is not yet complete, it is easier to finish the porch flooring at this point since the surface is still free of obstructing railing. If you choose pressure-treated two-by-sixes for your flooring, it is recommended that you use a solid color exterior acrylic-latex paint. For redwood, cedar, ipe, or other wood with a beautiful natural appearance, you may want to use a clear or lightly toned deck sealant or a penetrative oil. Your local building code may not require guard railing for a ground-level deck. Even so, you may wish to give your porch the finishing touch of handrails. If you choose to build a deck that is wider than 12 feet, it will be difficult to find boards that extend much beyond that length (two-by-sixes tend to max out at 16 feet). Instead, purchase shorter boards and stagger them at intervals across the joists. Remember that board ends must always rest on the tops of joists. If you later on decide to add a roof to the porch, you have a number of options. You can erect a short roof that cantilevers over the porch with no vertical supports. Or you may decide to cover the entire porch. If so, you will need to run new vertical posts to hold the end of the roof.